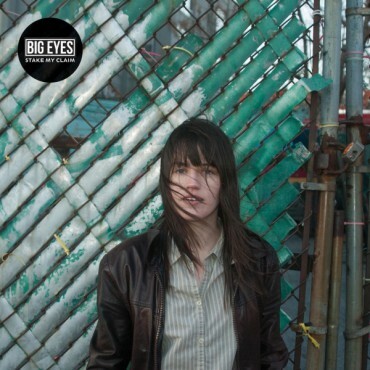 ALBUM REVIEW: BIG EYES, "Stake My Claim"
This Brooklyn-born band, led by singer-guitarist Kait Eldridge has a punchy, crisp sound, full of high energy, guitar driven pop in that classic late ’70’s/early ’80’s post-punk vein. Good production and a tight rhythm section give Stake My Claim, their third effort, a great feel. It also helps that the songs are well-constructed and catchy. The title track kicks off the collection and is 100 m.p.h. before it comes to a quick and sudden stop, going into “Behind Your Eyes” which is infectious – and it has to be said, Ms. Eldridge’s vocals are warm and embracing (think of a less-raw Joan Jett) and her guitar sound has a great crunch to it; “Just Not Right” is a little slower but again, an instantly catchy number that goes into full throttle in the middle – she certainly knows how to write a song and also to keep it in economic time. “Leave This Town” is a “visual” track – you can imaging a movie in your mind to the lyrics; “When You Were 25” is a “classic punk” tribute to the pains of ending youth (21 to 25 IS a transitional period that usually spells out there’s no way back and it’s time to move always forward! ); “Curse Of The Tides” is all of 50 seconds but explodes out at you, a complete song – a style that would make Wire or The Minutemen proud and “Alls I Know” is pure power pop at its glorious best. Ten songs, none longer that 2:59, but instantly memorable, rather than the opposite. A very good and focused album – and obviously a great deal of talent from the writing of Kait Eldridge. One of Brooklyn’s best offerings is Big Eyes and this is one hell of a delivery.